The ESB unveiled record profits last week. Its 2015 operating (pre-interest) profits jumped by 15pc to €635m. These rapidly rising profits come at a time of falling natural gas prices, the fuel from which most Irish electricity is generated. The ESB grew its net sales (where intra-group sales are excluded) by 2.4pc to €3.33bn last year. However, while its Electric Ireland electricity supply business was responsible for almost half of its gross sales (€2.1bn), it recorded operating profits of just €44m - less than 10pc of the group total. The big money-earners at the ESB are its high-margin power generation and distribution activities. Operating profits at power generation were €137m on sales of €1.4bn, an operating margin of 9.7pc. Electricity distribution was even more lucrative with an operating profit of €287m on sales of €954m, a whopping 30pc margin. It is this quintupling in underlying pre-tax profits, rather than the much more modest increase in operating profits, that almost certainly provides the best gauge of the ESB's performance last year. The fall in crude oil prices since mid-2014 has been well documented, with a barrel of Brent falling from over $110 in July 2014 to just $26 at one point in January of this year - this fall in crude oil prices has since been partially reversed with Brent trading at over $40 this past week. 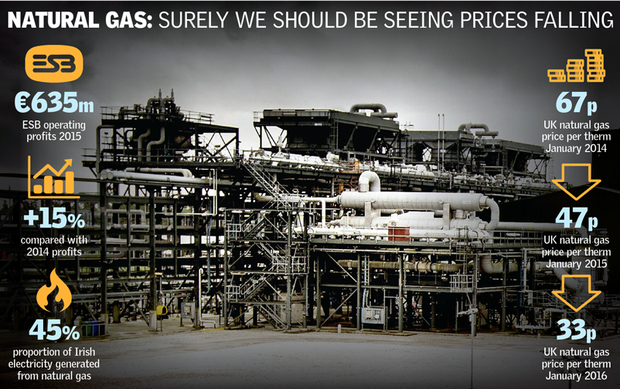 Less well-publicised has been fall in natural gas prices over the same period. Unlike crude oil, for which there is a relatively transparent, global market, difficulties in transporting and storing natural gas mean that the market for this commodity is opaque and far more geographically fragmented. Demand for natural gas is also much more seasonal. Natural gas demand, and prices, generally peak during the northern hemisphere winter from November to February and fall rapidly with the coming of spring. The main buyers for natural gas - electricity generators and natural gas utilities - need a constant supply in order to ensure being able to meet their customers' needs 24/7. This means that they are far more likely to be tied into long-term contracts, often at higher prices, rather taking their chances on the spot market. Even after entering all of these caveats, there is little doubt but that there has been a steep fall in UK natural gas prices, the market in which Irish customers buy most of their supplies. In January 2014, UK natural gas was trading at 67p a therm. This had fallen to 47p by January 2015 and to just 33p by January 2016, a fall of 51pc in sterling terms. When the rise in the value of sterling against the euro over the same period is taken into account, the fall in euro terms is somewhat less, about 45pc. Natural gas is by far the single biggest fuel source for Irish electricity, with 45pc of our electric power being generated from the stuff. So has this fall in natural gas prices been passed on to Irish businesses in the form of lower electricity and gas bills? The signals are at best mixed. The latest figures from EU statistics agency Eurostat are for the first half of 2015. These show that medium-sized industrial electricity users in Ireland were then paying 44pc more than the EU average, while medium-sized gas users were paying 9pc more. On the other hand, there is clear evidence that at least some Irish businesses have seen significant reductions in their gas and electricity bills, with the CSO's most recent wholesale prices index showing that manufacturing industry was paying 19.6pc less for electricity in January 2016 than it was a year earlier and 16.4pc less for "energy products", basically natural gas. So is Irish business receiving the full benefit of lower natural gas prices - or are the ESB and other utilities only passing on some of the price reductions and padding their own profits at customers' expense instead? "ESB's 2015 results represent a 6.5pc return on the capital employed in the group. This is in line with its European peers of 7.3pc, for those that have published their results so far," says an ESB spokesperson. The ESB says it needs to make profits of this magnitude to pay the interest on its €4.9bn of borrowings (€215m in 2015), tax (€45m), dividends (€273m) and to finance investment in infrastructure (€873m last year). "Electric Ireland, ESB's supply business, has a net margin of about 3pc. It has a policy of passing wholesale price decreases through to customers as they occur," says the spokesperson. True, but quoting the Electric Ireland margin in isolation is somewhat misleading, as it excludes the very high margins other ESB subsidiaries are making from generating and distributing electricity, much of which is bought by Electric Ireland. "Fuel makes up less than 30pc of the cost of electricity to customers, and is purchased 12-24 months in advance and in sterling. All wholesale price decreases achieved by Electric Ireland have been passed through to customers. Electric Ireland will continue to monitor energy markets and is actively looking for opportunities to further decrease customer prices," says the ESB spokesperson. In fairness to the ESB, it should be pointed out that even if it has been somewhat tardy in passing on lower fuel costs to customers, it does have at least some excuse. Last year's €273m dividend was not a once-off. In recent years a cash-strapped Exchequer has been using the ESB as a sort of piggy bank to be regularly raided. The ESB has paid the State €1.5bn in dividends, including €400m over the past four years. While it is only right that the ESB pays a dividend to its shareholder - the Irish State - were some of the dividends levied in recent years effectively a surreptitious tax on electricity customers, both businesses and households? The Irish electricity market was deregulated for business customers in 2005 with the natural gas market following two years later. Businesses can now shop around for the best energy price deals. Keeping gas and electricity suppliers honest is the job of the Commission for Energy Regulation (CER). So how good has the CER been at doing its job? While at least some of the fall in natural gas prices has been passed on to business users, the fact that Irish businesses are still paying significantly more than the EU average for gas and electricity would seem to indicate that more still needs to be done to ensure a fully competitive market. Has deregulation lowered the gas and electricity prices paid by Irish businesses, or are they still paying over the odds? "There is active competition in the Irish electricity and gas market," says a CER spokesperson. "Ireland has moved to where there are numerous electricity and gas suppliers competing, providing customer choice and keeping prices at competitive levels. "In a deregulated market, it is consumer pressure and the competition that it generates that ensures prices are as low as possible. "Also, while there have been reasonably significant reductions in wholesale gas prices since the beginning of this year, the impact of supplier hedging means that there will be a time lag before prices are also reduced." But businesses are growing impatient. "Falling gas prices and weaker sterling should be making industrial power prices more internationally competitive at present," says Neil Walker, head of infrastructure at employers' body Ibec. "The next set of comparative data ought to confirm this. "However, the degree to which individual industrial electricity users are now benefitting from the recent drop in gas prices depends partly on their commercial hedging decisions. "Some users have opted for contracts where the monthly price is explicitly linked to the monthly average wholesale price. Others prefer budgetary certainty over a longer period (say six or 12 months)," says Walker. For businesses, large and small, the best advice is to shop around for gas and electricity. And while they do that, the good news is that prices almost certainly have further to fall, according to the CER spokesperson. "Given the most recent moves in wholesale prices, the CER believes there is scope for further tariff reductions by suppliers in the coming months," they say. Irish businesses will be counting the days.